Now, for those of you who've been out of a bio class for a while, let's remember that photosynthesis is the molecular-scale shenanigans plants use to create food from sunlight. But why, exactly, is photosynthesis worth freaking over, a bit? Well, let's jump into my way-back machine! When life first formed on Earth about 4 billion, or so, years ago, the only way single-cell critters could get energy was from chemistry. They had to find high-energy chemicals like methane and covert them into low-energy chemicals like carbon dioxide. What was left over they used for, well, you know, being alive. But it was hard times. The chemical foodstuff like methane was limited. That kept life from doing what it likes best — reproducing like crazy to take over the entire planet. So, from life's point of view, the situation back then was a little like trying to run a marathon on a diet of saltines. But, then, evolution got creative. Really creative. The sun sends the Earth the energy equivalent of 8,000 atomic bombs every second. Eventually life, through evolution, figured out how to directly tap the energy in all of that sunlight. By combining light particles with molecules of carbon dioxide and water, photosynthesis opened the energy floodgates — freeing life from its starvation diet. Did I mention life taking over the world? Because that's what happened. Literally. Using photosynthesis, life changed the entire planet. If you think I'm exaggerating, take a deep breath. The atmospheric oxygen you're sucking in is only there because of photosynthesis. If it stopped, the oxygen in the air would react away pretty quickly. And why is oxygen so important for the Earth's history? For starters think of big brains, like the kind we have knocking around our skulls. They would never have evolved without the high-powered biochemistry oxygen allows. So that means you can thank photosynthesis for even thinking about thanking photosynthesis. Oh yeah, you can thank photosynthesis for our planet's characteristic blue-green color, too, since chlorophyll molecules, which are essential to photosynthesis, just love reflecting green light. So there you go. From ocean plankton to Venus' flytraps, inside every plant there is an insanely complex little molecular engine that turns sunlight into food. Across billions of years, life figured out how to pull off this trick and, in the process, photosynthesis shaped the history of the entire planet. Not bad for a bunch of biomolecules. So, thank a leaf next time you see one — and celebrate the glory of the green. The glory that is photosynthesis. Adam Frank usually has his head in the sky. He's an astrophysicist. It's an occupational hazard. Right now, though, he is dazzled by the universe of green right here on Earth. ADAM FRANK, BYLINE: Now that we're well past the start of spring, you're probably inured already to all the green - well, not me, Pal. See; this Spring, I've been digging in on photosynthesis for some research I'm doing. And I got to tell you. It's blowing my mind. Now, for those of you who've been out of a bio class for a while, let's remember that photosynthesis is the molecular-scale shenanigans plant use to create food from sunlight. See; when life first formed on Earth about 4 billion years or so ago, the only way single-cell critters could get energy was from chemistry. They had to find high-energy chemicals like methane and convert it into low-energy chemicals like carbon dioxide. What was left over they used for, you know, being alive. But times were tough. The chemical foodstuffs like methane were pretty limited. So from life's point of view, the situation back then was a little like trying to run a marathon on a diet of saltines. But then evolution got creative, really creative. The sun sends the earth the energy equivalent of thousands of atomic bombs every second. Eventually life, through evolution, figured out how to directly tap the energy in all that sunlight. 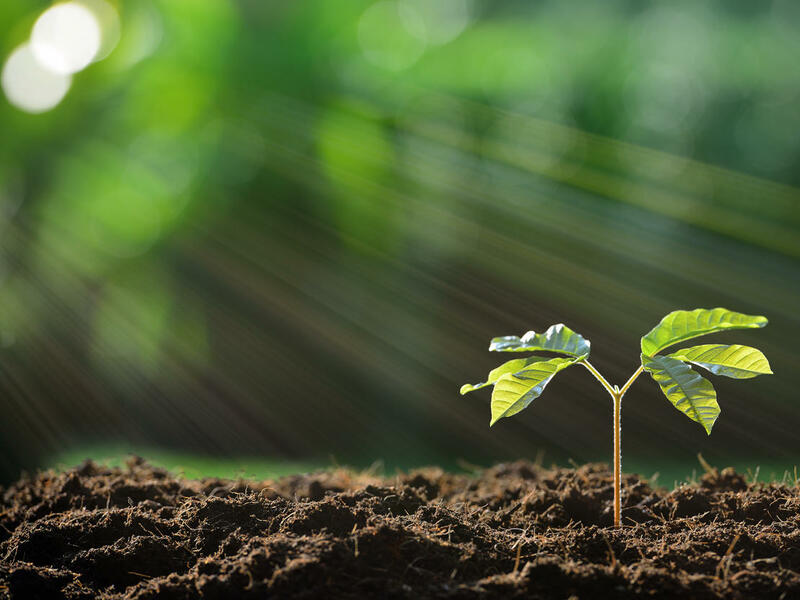 By combining light particles with molecules of carbon dioxide and water, photosynthesis opened the energy floodgates, and it freed life from its starvation diet. Don't care yet - well, take a deep breath. The atmospheric oxygen you're sucking in is only there because of photosynthesis. If it stopped, the oxygen in the air would react away pretty quickly. And why is that oxygen so important for the Earth's history? Well, for starters, brains like ours could never have evolved without the high-powered biochemistry that oxygen allows. So that means you can thank photosynthesis for even thinking about thanking photosynthesis. From ocean plankton to Venus flytraps, inside every plant, there is an insanely complex little molecular engine that turns sunlight into food and spits out oxygen. So take a moment to thank the next leaf you come across, and celebrate the glory that is photosynthesis. SIEGEL: NPR blogger Adam Frank.